Easter has now passed, and the start of the Pinot Noir project has officially begun! The first tasting and food pairing occurred on Good Friday. The first wine tasted was Louis Latour's 2009 Pinot Noir, an AOC from the Beaune region of Burgundy. Two bottles of Louis Latour were purchased for $21 each and were rated an average of 84-86 points by various websites. We used one bottle to marinate the leg of lamb - it was marinated in a combination of the wine and various herbs for 24 hours. I found this full-bodied wine to be very characteristic of what I've read a good Pinot Noir to be - hints of red fruit on first nose, but opens to more vegetal aromas like green pepper and wet leaves once swirled. I personally detected hints of red currants, black pepper, bell pepper and coffee on the palate. Overall: A good quality pinot at a good price. A great one to start the project with. When paired with the lamb, the wine was able to withstand the bitter flavor of the meat, and the acidity didn't overwhelm the tomato sauce in the caponata. Great pairing! During the Easter weekend, I found a wine book I purchased awhile ago called The Wine Planner. The book lists some wines to try, what vintages, qualities and characteristics of each wine and what food to pair them with. I made a list of all the Pinot Noirs in the book and set out to my favorite liquor store, Willow Park Wines, to see if I could find any of them. While there, I met the new teacher of the WSET Program and told him what I was looking for (I forgot his name already-thanks Mommy brain!). He helped me locate one, Villa Maria's 2010 Pinot Noir, from the Marlborough region of New Zealand. The Wine Planner pairs this pinot with smoked cheese, so I chose a smoked gouda to accompany the wine. I detected a bouquet of cranberries and ripe cherries on first nose. After swirling, the second nose opens to green peppers and damp earth. The palate is slightly spicy and has a medium-high acidity, and wasn't as full-bodied as the Louis Latour. 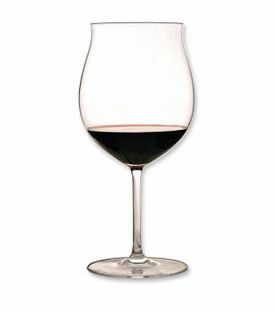 The palate is very representative of the nose-cranberries, ripe red cherries, bell peppers with a spicy black pepper finish. I found this wine to be of acceptable quality-not nearly as good as the Louis Latour. This wine could be consumed on it's own, but I much preferred it when paired with the smoked gouda and gourmet crackers. I was able to pick up 2 of these glasses for $10 total at Stokes as they were on sale. All of the other pinots that I taste will be done in these glasses. -I have decided to mark the end of the Pinot Project as of Sunday, September 23rd. We have a bottle of Veuve Clicquot N/V in our cellar that I've been dying to get into since we bought it last year. I figured a good date to drink it would be when we celebrate our anniversary, which is September 27th. The Wine Planner lists this champagne as an ideal pairing with bagels with cream cheese and scrambled eggs - I really want to see if this works! If it doesn't, then we drink it on it's own during and after our anniversary dinner. -New Pinots on my "hit list" that are found in the area: La Crema, and Mission Hill 5 Estates. If I can find it, the Gallo Sonoma County Pinot Noir comes highly recommended. The Mission Hill Pinot will be paired with salmon. Up Next: Inniskillin's 2010 Pinot Noir from the Niagara region, and it will be tasted on it's own.